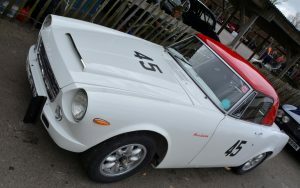 The first of the Fairlady models came courtesy of Datsun’s Sports SPL213 in 1961, these should not be confused with the ‘Z’ versions that arrived much later in that decade. This ridiculously attractive sportster acquired its most suitable branding in 1961 when Nissan President Katsuji Kawamata was visiting America and took in the long running Broadway show ‘My Fair Lady’. The Datsun Sports model 211 was launched in June 1959 and came complete with a 1.0 litre engine packing 34bhp but it was the improved 213 that enjoyed the ‘Fairlady’ label whilst Datsun benefited from a surge in sales. The SPL213 received 60bhp from its 1189cc motor and another incarnation of the car named after a musical went on sale in 1962; engine increased further to 1488cc putting 70bhp through its tyres. The model’s popularity especially in the home market rocketed after victory at Japan’s 1st Grand Prix, held at the Suzuka race track in front of an estimated 200k fans in May 63; especially within a class of up to 2.5 litres. Performance increases continued in 1965 (1600cc) and again in 1967 when a 2.0 litre fuelled via twin carbs with five speed transmission took this little gem to nearly 130mph. The Fairlady branding introduced by Kawamata went further than just the vehicle, it also became the title for Datsun’s ‘sales ladies’ at their main Tokyo showroom. With the 1964 Olympics came heavy investment in Japan, much around the entertainment and trading centre of Ginza district of Tokyo. At this prime location the Datsun brand was displayed complete with beautiful female showroom attendants, all fully trained and well paid; known as ‘Miss Fairlady’s’. Although hundreds applied, just five were accepted and trained as the first class of demonstrators to explain the virtues of Datsun’s range, including their sports models. The immaculate and knowledgeable Miss Fairlady’s are still to be found pushing the Nissan brand in Japanese dealerships today but CMM would love to hear from any reader that has enjoyed that wind in the hair experience of the original 60s Fairlady sports car; any ‘Fairlady’ sales stories would just be a bonus. One visitor to September’s Isle of Wight Show that caught my eye enjoyed a very busy weekend, fielding questions and explaining to the masses the virtues of the Paramount sportscar. 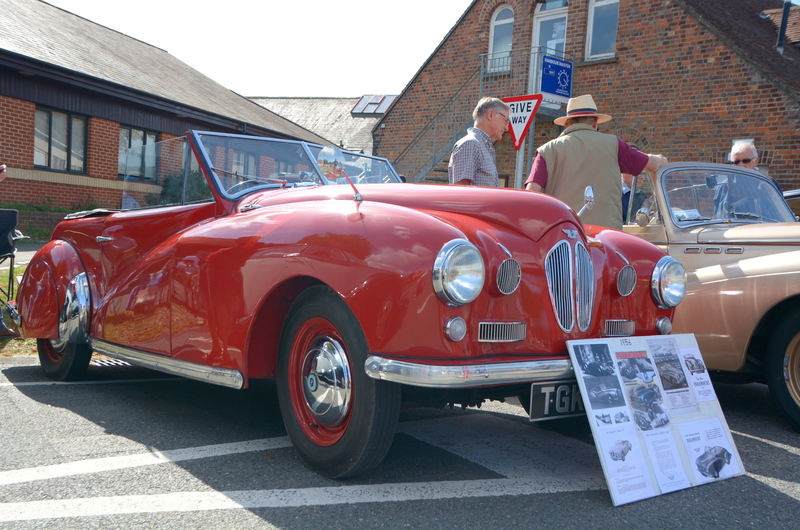 This actual car is chassis number 60 and thus the final vehicle produced by the manufacturer who originally began life in Derbyshire before moving to Leighton Buzzard. Hand built from 1949-56 the majority being a roadster body, although a few saloons were constructed. Its ladder type underslung chassis accepted the Ford Ten engine with an option of the Sharrocks or Wade supercharger. At £886 including tax in 1954 the Paramount wasn’t exactly transport on a budget but offered superb build quality with a steel tubular chassis and ash frame all wrapped in hand shaped aluminium panels. Adjustable leather seating, 12-volt electrics, safety glass and a sporting drive with oversize Girling brakes too match, plus a choice of seven exterior base colours with a metallic option for each and two types of silver finish. With a maximum speed of 70mph the arrival of the 1 ½ in the mid-fifties improved all round performance incorporating the 1508cc unit from the Ford Consul. The Paramount with all its refinery was competing with the not too dissimilar Jaguar XK120, although the Coventry roadster was an additional £370 (enough for one Ford Anglia) in 1949 and enjoyed two less seats. A four-seat roadster was a rare sight on Britain’s roads during the 50s and admiring the 1 ½ sixty years later, its demise is something of a mystery. When production ceased the remaining chassis (that may well have included this car) were taken by Welbeck Motors in London who retailed them at a substantial discount from the original factory price. Restored between 1998 and 2000, chassis number 60 is one of a handful left on the road and as always CMM would be pleased to hear from readers that can tell us more of their Paramount experience.